It’s tough to have a Vacation film without that John Hughes flair. But screenwriter, Elisa Bell, has the right idea comedically and stays fairly true to the vibe of the first three films. The only issue with Vegas Vacation is that there’s no bigger picture within the plot. Or the one that’s present feels overly contrived. 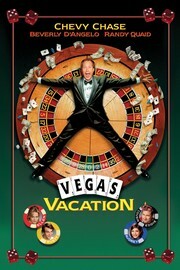 In this installment, Clark Griswold (Chevy Chase) takes his family to Las Vegas for vacation. There, Clark turns into a gambling addict and becomes estranged from his family. His wife (Beverly D’Angelo) and kids get upset at him and decide to go off and have their own pleasures fulfilled. Honestly, Clark’s behavior isn’t all that bad from what his family can see, so I don’t understand where their bitterness is coming from. They’re unaware that he’s losing money, and the times that he gets separated from the family usually aren’t his fault. I get the whole “you’ve become selfish, so become unselfish again” concept, but the conflict feels forced for the mere sake of having conflict. Even Clark’s epiphanic moment is sudden and without a believable catalyst. Just as there is no real reason for Clark’s family to be mad at him, there is no real reason why they reconcile in the end either. The best part of this film is its humor. Although over-the-top at times, there’s nothing too out of the ordinary for a Vacation film. The most inventive bit is when Clark finds a casino full of made-up games, such as “Rock-Paper-Scissors” or “Pick a Number Between 1 and 10”. Overall, it’s not a bad watch. It’s at least good for some cheap laughs and some ’90s Vegas nostalgia. And I get that the audience may want to see more from the Griswolds, but at least give them something more rewarding to make the trip worth while.